Core Power has become a favorite of mine since attending the Blend Retreat. I have never purchased premixed protein shakes before. I remember trying a Slim Fast shake that a co-worker had years and years ago and still remember the tin flavor of the shake. So I guess I formed the option that all premixed protein shakes would all taste like that. Well Core Power changed that for me. The Core Power products are like drinking a milk shake, but with protein. I am really in love with the vanilla flavor, but the honey is right there behind it. It’s like getting a treat after working out, but this treat is beneficial and supports your recovery. They also have a chocolate flavor, but I did not get to try that flavor, but based on the other two I tried, I do not see how you could go wrong. Check out their product description, it really sums it up. Introducing core power high protein recovery drink: Don’t leave your workout unfinished. Sometimes we forget we need to fuel our bodies after working out in order to rebuild muscle and gain strength. 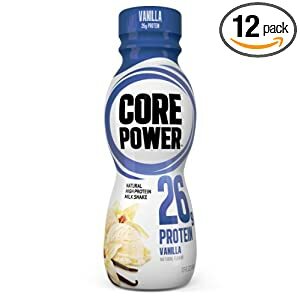 You can find Core Power at Amazon.com just follow this link. They are sold by the case and they also offer a Strawberry Banana Slim Version if you are looking to cut back on calories. The slim version offers 20 grams of protein. Did you catch the bullet that it is lactose free milk? I do not have any food restrictions, but I heard several attendees at the Blend Retreat state how excited they were that Core Power used lactose free milk. Again Core Power can be found on Amazon.com. They also have a great website that features a Blog with tips and information on health. Core power is also available in some stores, to see if a store is near you Check Out This Link. Question of the Day: Do you use protein shakes to recover and rebuild after working out? We had amazing weather this weekend. I did so much yard work and gardening. I’m sore, tired and hot. Here’s a few of the eats I enjoyed over the weekend. This is not my first time adding Kale to a smoothie, a while back I did a post called Keeping Up with Kale. I enjoy adding greens to my smoothie, you get a nice color and it adds a little texture. Added to my Fitmixer protein powder, makes a nice think shake. This is my third kale smoothie this week, yummy. After blending the kale leaves become tiny flecks. For dinner I used the rest of the kale for Kale Chips. I used my toaster oven, it works great for small batches, if I have a large batch I use the oven. Also roasted up some Tofu and Cauliflower. I love this combo because they can be roasted at the same time. 425* for 25 minutes. We also had a side of Udon noodles. We ate dinner on the deck again tonight, I love dining outdoors, plus I wanted to take in all the work I had done, I love doing yard work and gardening. I am really excited to pick out all my annual flowers for pots which I plan on planting over the Memorial Day Holiday. I will be posting a lot of flower pictures this summer. Question of the Day: Do you eat outside on nice days? Completed Day #1 of the Best Body Boot Camp. Getting organized and prepped for it was really easy, Tina provided all the information, I just needed to put in the work, and work I did, wow it was a great workout. So after my workout I wanted to really fuel my body, so I made a Recovery Smoothie with fruits and spinach. The banana and spinach were fresh and the cherries and strawberries were frozen from my smoothie stash. Today I added a little Swanson Organic Date Sugar into the mix, I really wanted to see if it would sweeten it up a bit. Date sugar is a lower calorie and healthier option to brown sugar. Two of the little scoops are only 30 calories. I only used a 1/2 of the scoop, just to give it a try. Verdict, I liked it, and it did give the smoothie a sweeter flavor that it needed. I look forward to using in a muffin recipe that I plan on making. I really love the little scoop that it came with. Loaded up the smoothie maker and let it run for about 45 seconds, I had to shake it up a bit and run it for another 30 seconds to really blend the ice cubes well. This is just what I needed. This will hold me over until dinner tonight. I also added a handful of Kashi Heart to Heart Cinnamon Oat Cereal. Question of the day: What’s your favorite cold cereal?